The first of our 2019 D.A.R.E. Officer Training’s will be held in Culpeper, Virginia June 10 – June 21, 2019. This DOT will have a cut-off at 24 officers. We have the dates of our second DOT set for October 7 – October 18, 2019 at the Fort Magruder Hotel and Conference Center Williamsburg, VA. Please complete the application using the link below and submit so we can add your request for training. We anticipate these DOT to fill quickly. More information to follow, to include cost and lodging. PLEASE email Mark Medford, mark.medford@dare.org or Rob Hefner, dare.guy@hotmail.com to make arrangements to pick up workbooks. Please have your Statistical Date Reports turned in before requesting workbooks. 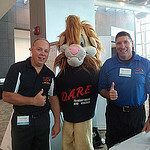 Virginia SOL Correlation Guides for D.A.R.E. The Virginia D.A.R.E. Training Center tasked one of our D.A.R.E. Educational Advisers, Bonnie Bazemore, to develop an updated Virginia SOL correlation guide for both elementary and middle school D.A.R.E. This exhausting job was complete in June of 2016. The VDTC is proud to release these documents for D.A.R.E. officers to share with their local school districts. Need a DAREN Costume for that next event? We have one! Contact us for more information.